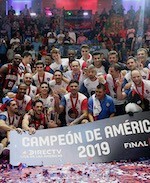 Guaros overcame Ponce en route to the title game. Zach Graham (198-G-89, college: Mississippi, agency: Pro Sports) came up with 27 points to pace the Venezuelan side. Guaros dropped 27 points in the first period to gain a 9-point lead. They followed with a 28-point effort in the second term to secure a 14-point halftime lead. Guaros protected the advantage throughout the second half and marched to the win. Nestor Colmenares (203-PF-87, college: Campbellsville, agency: Pro Sports) delivered 14 points for the winners. Victor Liz (188-SG-86, agency: Basket Management Solutions) responded with 25 points for Ponce. Weber Bahia rallied past Fuerza Regia to advance into Liga Americas Final. Lucio Redivo (183-G-94) posted 23 points to lead the winners. Weber Bahia established a 34:28 halftime lead. Fuerza Regia narrowed the gap at 4-point mark heading into the fourth term. But Weber Bahia sank 23 points in the final quarter and sealed the victory. Anthony Laveal Johnson (203-C-88, college: Fairfield) delivered 14 points and 10 boards for the winners. Jordan Glynn (200-F-89, college: SF Austin) responded with 15 points for Fuerza Regia.